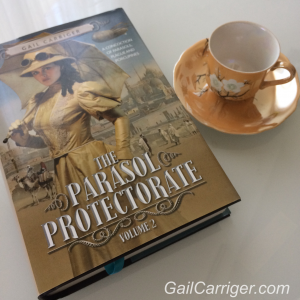 A fun little conversation over on the Parasol Protectorate Facebook group sparked this blog. So thank you, Gentle Facebooker, for the prod in the articulate direction. Akeldama ~ Ak-el-DA-ma (It’s mispronounced in the first audiobook because they didn’t consult with me until the second.) I don’t know how it would be pronounced in the original language but is has to be pronounced DA-ma for reasons that become apparent in the Timeless. Featherstonehaugh ~ fan-shaw (Chosen because I knew it was one of “those” British names and I just wanted to mess with people. Also, I’m a big fan of the movie adaptation of the EM Forster novel Maurice.) There’s contention over this one and I think it is pronounced differently in different classes and parts of the UK. If anyone who HAS this name wants to tell me more, please do. Most of the names have google-able meaning. Once in a while the names was invented via a drunk friend (Hisselpenny). I’ll looking at lists of old fashioned and Victorian names to make sure it is not modern. 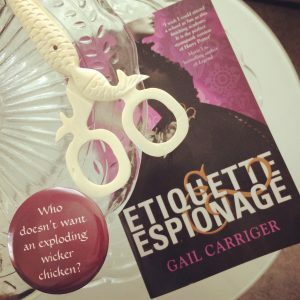 I try to ensure not too many characters in the same book/series have names starting with the same first letter (Dimity, Agatha, Sophronia). 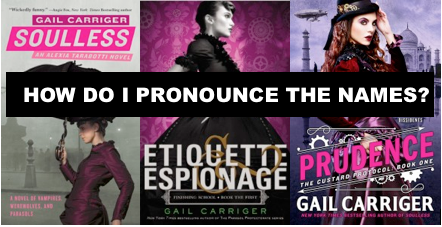 My heroines need names that are different from each other between series (Sophronia, Alexia, Rue). Or I simply like the name for no good reason, as if that character told me what they wanted to be called (Alexia, Soap). I haven't often heard Featherstonehaugh pronounced, but when I have it has always been Fanshaw. Agree with MadScientist on the pronunciation of Featherstonehaugh as Fanshaw. It's the only name I'm pronouncing differently from your canon, although I had to look up Sidheag. 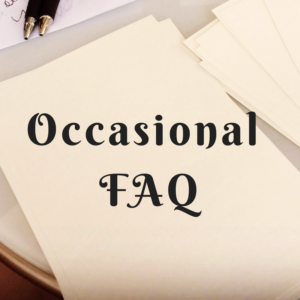 Which of the two variants applies to the character in your (wonderful) books?